What a treasure of a photograph! 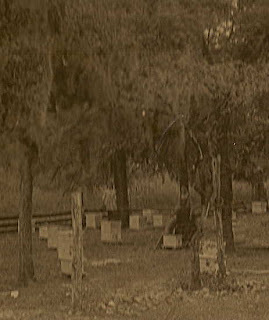 I thought my Aunt Fannie Lou Hollingsworth Parker's four hives in her side yard was more than enough bees for me --- this apiary is packed. I agree with your assessment that those clearly look like bee hives/boxes for colonies. But is the child standing on one of them? That is the only "pause" I have --- the child standing on a bee hive! A local honey producer in Mississippi over-winters his bees here; has his commercial honey packing plant here --- but the bees do their work in the huge agricultural areas of the upper mid-west. He transports the hives by the trailer load to the fields in early spring and returns them here in late fall. I've seen summer apiary sites with almost as many hives as shown in this picture along the edges of fields of several hundreds of acres --- but I don't ever recall seeing this many hives in such a small space. Was this location in the midst of a huge farming area? Could this be the wintering site for a collection of bees? By chance is this aviary in a citrus grove? 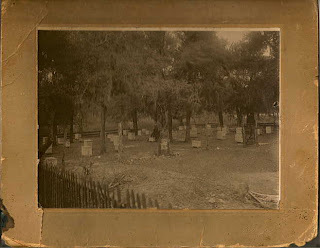 I really know very little about the apiaries my Great Grandfather owned. In 1905 it would have been on the outskirts of Austin Texas. Not knowing much about apiaries either, my assumption is that when the bees are in the boxes, those outside are safe. Though it would take courage for a young child to stand on the box. It's also possible the box she is standing on is empty.